As we delve into planning our kitchen remodel, there are so many decisions to make. Today’s decision is kitchen cabinet door styles – inset, partial overlay or full overlay. I’ve been perusing all of the kitchens I’ve pinned to find the common denominator to help me choose. First, let’s talk about the options. Inset kitchen cabinet door is the most traditional, but it’s also the most expensive. An inset cabinet door is flush, giving it a very clean aesthetic. 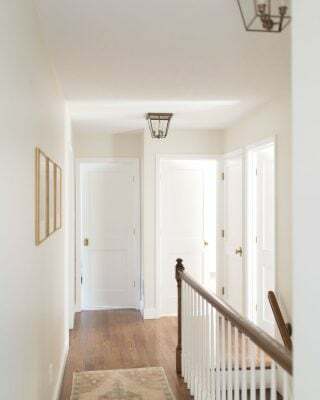 See how the doors below are flush with the frame and the detail is inset? Pretty, right? Partial overlay is what we currently have – the doors are attached to the front of the kitchen cabinets, sticking out a bit, with space between the drawers and cabinet doors. See the space between each cabinet door and drawer? Full overlay is a bit more modern, but for me preferential to partial overlay because it offers a cleaner look and doesn’t waste an ounce of space. 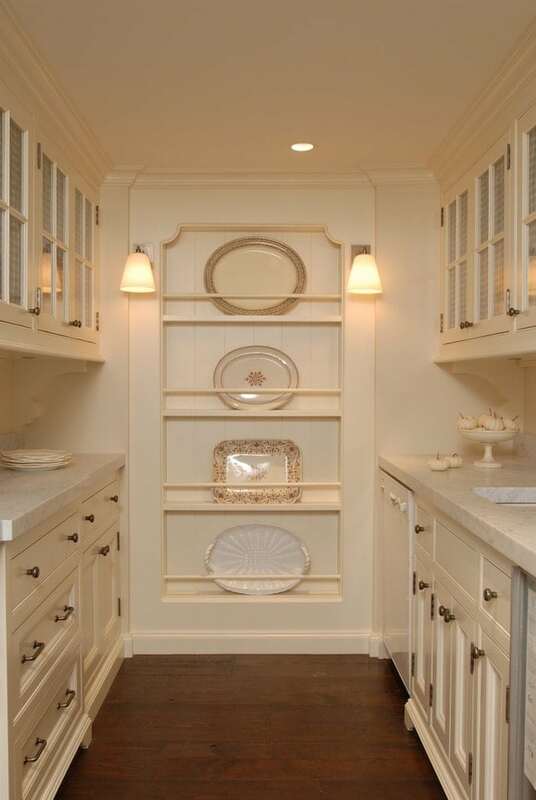 You don’t see the frame, which is appealing and is less expensive than inset cabinets. 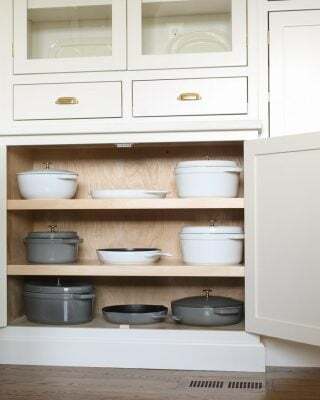 I think the full overlay is a great alternative to the slightly more expensive inset cabinet door style, but after seeing all of my favorite kitchens, I’m leaning toward inset. I want to love our kitchen and have no regrets. I don’t see myself compromising on the kitchen, but what we need to do to get it, making concessions elsewhere. 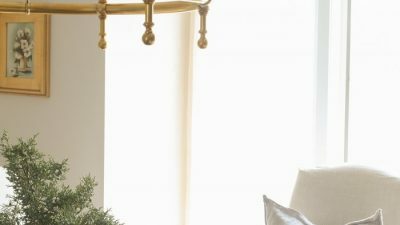 That may sound ridiculous, but I look at as an investment in what can be my favorite and most utilized space in our home. What do you think? What’s your favorite cabinet door style? Also, if you have done a kitchen renovation I would love to know what you would do different? What was the best choice you made? What do you wish you knew? Thanks in advance! Great idea, Jen! I can’t wait to see yours. A built-in fridge is pretty fantastic! Just redid my kitchen almost two years ago. I have two deep dish drawers and LOVE them. Wish I had room for more. Love your blog…just found you today. Oooh! Great ideas, June! Thanks for sharing. I’m taking notes! it’s so nice to meet you! My grandmother’s name was June and my youngest daughter is Isla June! Ew! Yikes! That made my heart hurt a little. Thanks for sharing, that’s definitely something to consider! I was debating about a pot filler, I’m adding it to my must have list, thank you! Your kitchen sounds beautiful! I decided I wasn’t going to spend the money on our kitchen unless I could see 3-5 at the island because I dream of the girls easily being able to cook and bake with me. Right now they drag chairs in from the breakfast room and I do my best to work with and around them, it’s not ideal. Oh a walk-in pantry! We can all dream, right? Thank you, Shannon! I am an independent kitchen and bath designer and wholesale cabinet supplier. I design and sell all of the different styles you mentioned. I have found the full overlay door is the best option all around. My brother has had inset cabinets in his home for ten years and he says never again. Like someone mentioned closing the draw by accident with a utensil not all the way in leaves a “in your face” damage. He also says with expansion and contraction there are time when the doors are hated to open causing it to twist and hinder the finish. He has cracks in the finish due to this condition. Bottom line is all cabinets and styles each have the issues. Full overlay has the least and due to the design it is the most forgiving. Thank you, Rhonda! If it’s not too costly, I’ll definitely work that in. I have to hire a plumber anyways. Thanks for your advice! And canning kitchen? A dream! 1 Build out the cabinet above the refrigerator to the front of the fridge for great storage. 2 The backsplash should only be under the cabinets and not on the side of any wall, and end where the cabinet does, not where the counter top does, for a more custom look. Read that at Carla Aston site :). She has lots of great info there btw. 3 Consider under cabinet lighting. 4 Pull out cabinet for trash can! 5 You probably aren’t considering it but just so you know, black shiny granite shows fingerprints (more like smears) like crazy and when the sun shines on it it always looks dusty! Love the look but not the maintenance. Wish I had gone with quartz, leathered finish or lighter granite like in my upstairs master bath. 2 – so true, I always thought tiled walls feel sterile and cold, better suited for a restaurant than an at home kitchen where you want it to feel warm. 4 – I couldn’t live without my pull-out trash can, but am excited to add recycling, too! 5 – such great insight! I’m considering quarts. Thanks for all of the advice, I truly appreciate it! The inset drawers are definitely gorgeous, though Jane’s comments are quite interesting. We are badly in need of a kitchen remodel (just glued a drawer back together last week!) but are hoping to hold off a few years. Melissa’s right about shiny black granite. We have it, and I hate it. It’s terrible for photography. Can you have your granite honed? I love that look – it mimics soapstone and I think it would be relatively inexpensive. However, if you’re planning to remodel it wouldn’t be worth it. We have drawer issues as well, I feel you! I’m heading over to look at their kitchen now, thanks, Leslie! You know, I don’t think there is ever a “right” or “wrong” when it comes to what you like. Only what is more important or less important to you. Do you cook a lot or is your kitchen more for show? And I’m not saying a kitchen for show is bad, but it might help you to be able to separate what you really want to spend money on as I’m guessing you’re on a budget just like everyone else lol. 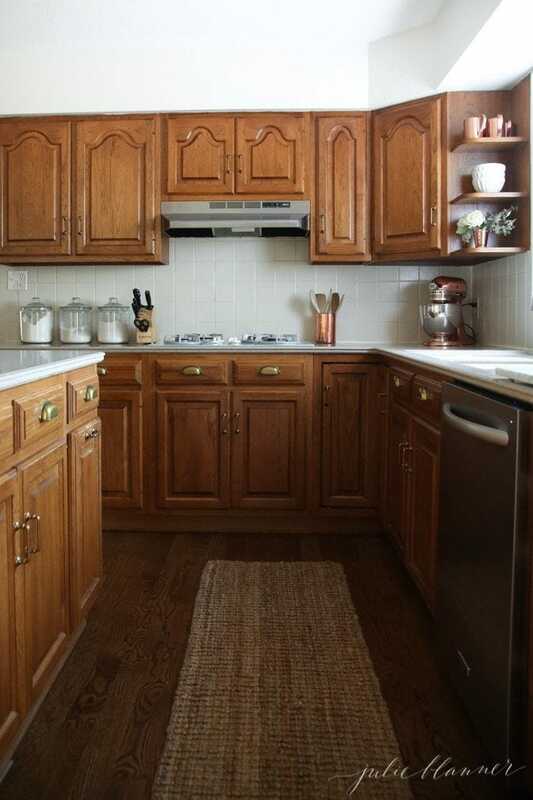 For instance I love the inset cabinets and would probably spend the extra money if my kitchen was just for show. 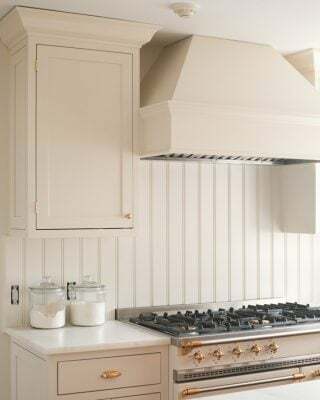 However, I love to cook so if I HAD to choose between restaurant quality appliances and the inset cabinets, I’d probably save a little on the cabinets and do the partial overlay so I could have nicer appliances to use. Someone who doesn’t cook, would probably choose the opposite. If money is no object, absolutely do the inset cabinets. I think they are the classiest. The pot filler doesn’t cost much at all when you’re remodeling, but will cost a lot to add on after the remodel is completed, so definitely go ahead and do it!! I am saver, and have spent most of my life going the “cheap route.” And 99% of the time I have regretted it. So while I think there are places to save money in remodeling a house, the kitchen isn’t one of them. I’m betting you will spend more waking hours in your kitchen than any other room in the house. So save money in those other rooms and splurge on the kitchen. Can’t wait to follow along and see what you choose! That’s excellent advice, Robbin, thanks for sharing! I have spared no expense on our new kitchen, but am so excited and think we’ll love it for years to come. 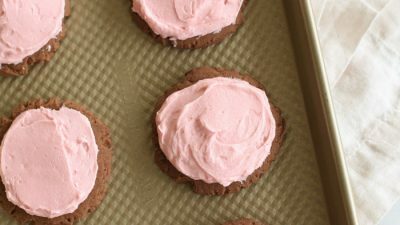 I absolutely love spending my time cooking, baking and entertaining, so in part of your advice, decided to go for it! We replaced laminate countertops with granite. It’s very nice, but a I wish I had gone with quartz. I also highly recommend under cabinet lighting. Thank you! I’m considering quartz or the marble we used at our previous home. I’m going to have to think about adding under cabinet lighting, I was planning to forgo it, but I do love having various types of lighting. I have never noticed this, but now that you point it out, I agree with you 100%! Oh, man. 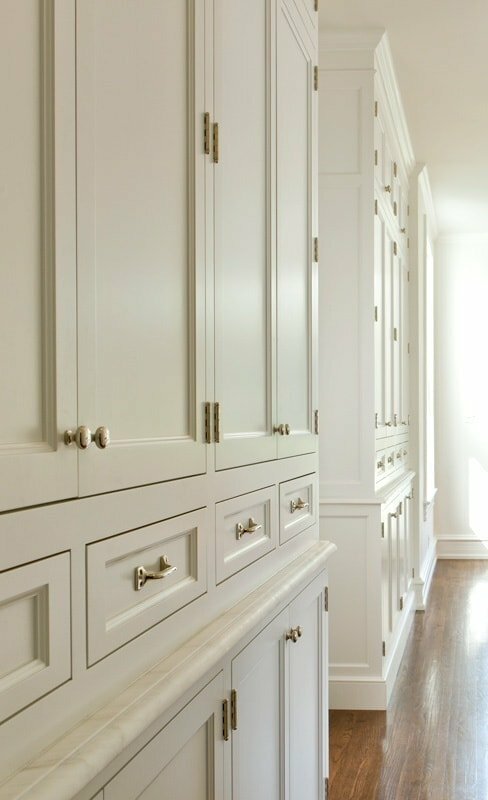 I dream of inset cabinetry, and that picture breaks my heart. Looking forward to watching your dreams come to life, Julie. Your style and functionality notes are so in line with what I hope to do someday….If my kids don’t grow before the chance comes along. ???? Thank you, Katie! I don’t allow myself to spend money in a space I want to renovate, but rather save it so that we can, that way I’m not spending twice. I hope you have the opportunity as well! I wish kitchens didn’t come at such a huge expense, it’s difficult to comprehend the cost! Feel free to live vicariously through me…you can come over for a glass of wine any time! We had the kitchen gutted and reno’d in the parsonage we are living in. I didn’t have the luxury of having my cabinets built to how I wanted the kitchen to function. We went with stock cabinets and high resolution laminate and a marble backsplash. I am happy with it and my hubby surprised me with pot faucet over the oven. And it’s so beautiful! Your marble backsplash is STUNNING! I also love your pot filler…I hope I don’t regret not adding one. I feel like I have to stop somewhere. ???? Would love to know where the antique brass hardware is from? You can find affiliate links to individual knobs/pulls here. Enjoy! I’m building and am now in the inset vs full overlay/frameless debate. We don’t mind spending the extra but my fear is the damage to the edges of the frame… I would be heartbroken. Are you happy with full overlays? SO happy with mine, no issues at all. Best wishes in your renovations, Holly! I am confused re comment below about you being happy w full overlay cabs. 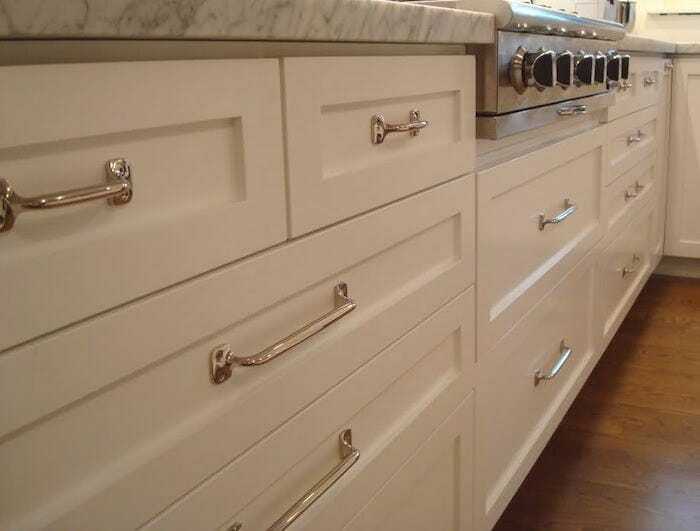 Is this an older post and your new kitchen w la cornue range — those are full inset cabs, right?! Are you happy with those even given your friend’s damaged drawers? This was written when I was considering them. I wouldn’t change it for anything, love my inset cabinet doors! They look clean and refined. I’m actually sharing a video tour of our kitchen today along with updated details of our completed kitchen.